I love springtime! Everything looks bright – vibrant greens, sunny yellows, eye-catching reds and oranges. Light breezes carry the heady scents of lilac and tulips. It’s so refreshing after a long, dreary winter (we’re in Michigan, where winter seems to never end) to see green grass and new buds on the trees. Spring is one of my favorite times to throw a party (of course!). There is no better reason to have a party than to celebrate the end of winter and the beginning of spring. There are several items we have at The Rosemary Company that are excellent choices for your springtime party (whether it’s a baby or bridal shower,). A favor I really adore is the Hippity Hop Frog Notepad (it’s also a keychain) and Pen Favor (fluffy with a froggie face on top). Kids and adults alike have a lot of fun with this favor. It’s definitely eye-catching, but it’s useful too. Other stuff you’ll love: Our Place Cards that are also Pl antable Seed Packets. These are perfect for most any occasion, and they’re eco-friendly. Seed packets are a customer favorite, and an excellent choice for a springtime event. “Please Be Seeded” is printed in script across the top. Other designs for the Plantable Place Cards include Starfish, Cherry Blossom, and Autumn Leaf. 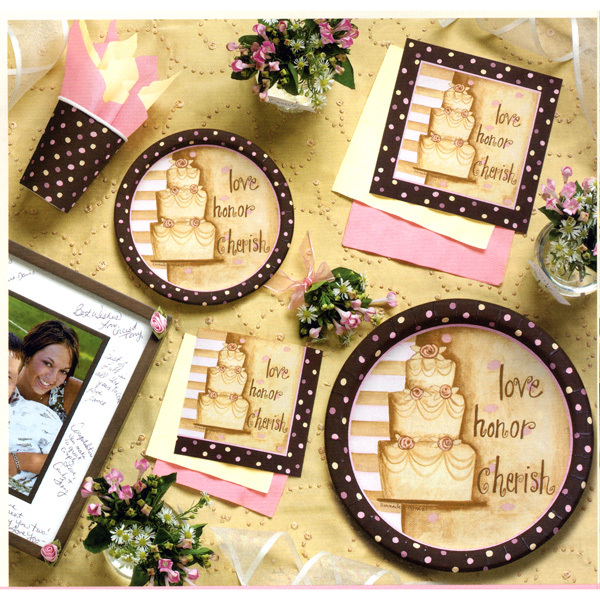 Blushing Bride: Set the scene for a party with our Blushing Bride party supplies. Lush bouquets and white wedding bells grace the front of this modern and very pretty line. This line will feature a Lunch Plate, Dessert Plate, Dinner Napkin, Beverage Napkin, and Beverage Cup. Coming Soon! For a vintage feel mixed with a contemporary design, you’ll love the Perfect Match partyware collection. Lovely with our new Chocolate Brown solid partyware line, polka dots and whimsical sketches make this collection the perfect match for your party! We’ll soon list Luncheon & Dessert Plates, Luncheon & Dessert Napkins, a Centerpiece, Invitations, and a Printable Invite too! Sure to be a customer favorite! Don’t miss our new solids: Chocolate Brown, Lovely Lavender, & Black Velvet. Solids are perfect to mix and match. These new colors will be online soon. Happy Spring!